Aranmula is a temple town in the state of Kerala, India. At a distance of around 116 km from Trivandrum, the capital of Kerala, it is situated on the banks of the holy river Pampa. A centre of pilgrimage from time immemorial and a trade post of eminence, when the river was the chief means of transport, it is near Kozhenchery in Pathanamthitta District.It is easily accessible from Chengannur railway station which is located around 10 km here. Aranmula is famous for the famous tourist attraction 'Vallam Kali',(Snakeboat Regatta), Aranmula is a global heritage site enlisted by the United Nations. It is a sacred site for the Hindus and comprises the central temple of Lord Parthasarathi with a network of temples and sacred groves around. Boat race is part of the temple festival here. Fertile wetlands, locally called Puncha, rich biodiversity and a soothing climate make Aranmula an apex model of the ecofriendly culture of Kerala. The region, as remote sensing maps show, has a rich stock of ground water which feeds the river Pampa and the estuaries like Vembanad. The rice producing belts like Kuttanad downstream benefit from the water cycle. Nearby important towns are Chengannur (10 km), Pathanamthitta (15 km), Pandalam (14 km). The nearest railway station is at Chengannur and airports are in Kochi, India and Thiruvananthapuram. Aranmula is located at 9.33°N 76.68°E﻿ / 9.33; 76.68. It has an average elevation of 7 m (23 ft). The Aranmula Parthasarathi Temple is a major temple in Kerala and has a great antiquity. It is one of the venerated 108 Vaishnava temples in India and finds mention in Tamil classics. Spread over a vast area the temple is on the banks of the river Pampa and the whole temple complex is at a high elevation. Main idol is of Lord Krishna, who is the charioteer of warrior Arjuna in Kurukshetra War. The temple has a flight of 18 steps that lead to the Eastern Tower while 57 descending steps from the Northern tower reaches the Pampa River. The temple here has fine murals from the 18th century. 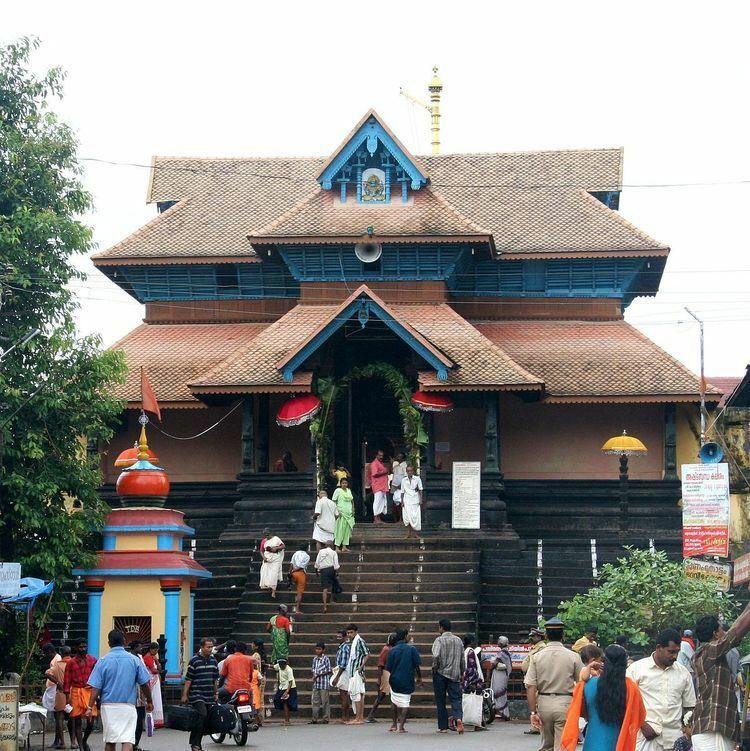 Pulikkunnumala Mahadeva Temple is 4 km from Aranmula. The old temple is traditionally said to be the worship place of the pandavas. This temple is donated by Koikkattumalayil the Late Shri Ramakrishna Pillai to the Kshetra Samrakshana Samiti, Kerala. Aranmula Grama Panchayat is the local governing body of Aranmula. The office is in between Kottakkakom and Kalarikkodu. The Ministry of Civil Aviation of the Government of India has issued a letter dated May 25, 2015 withdrawing the ‘in-principle’ approval to the proposed Aranmula Airport Project. The Civil Aviation Ministry has also forwarded copies of the letter withdrawing the approval for the airport project to the Prime Minister’s Office, Rashtrapathi Bhavan, Ministry of Home Affairs, Defence Ministry, Planning Commission, Departments of Economic Affairs and Revenue, and the Project Monitoring Group at Vigyan Bhavan in New Delhi. Prior to this, on May 8, 2015, the Ministry of Defence withdrew the No Objection Certificate (NOC) to the project. Earlier, on May 28, 2014, the National Green Tribunal (NGT) had cancelled the environment clearance granted to the project by the Union Ministry of Environment and Forests.